Let’s face it. We all love looking at pictures of beautiful kitchens but what good is a pretty kitchen if it’s not functional as well? 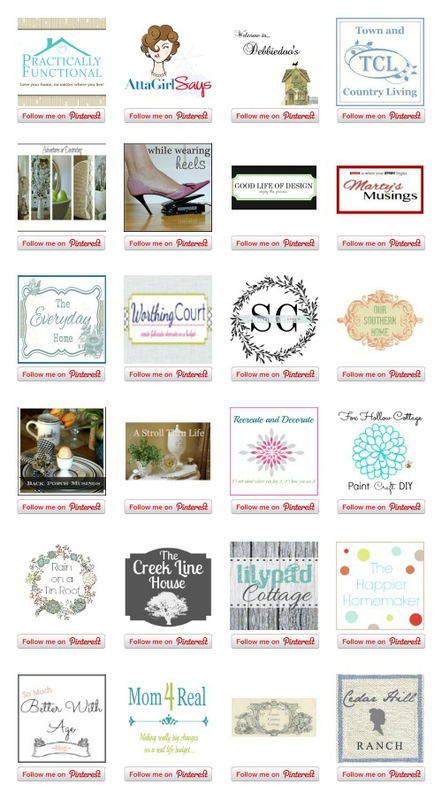 That’s why 24 bloggers have joined forces today and tomorrow to share kitchen decorating tips with you. Not only that, but we’re offering 2 fabulous prizes for 2 lucky winners … a Pfister faucet and a $250 gift card (details at end of this post)! So back to the task at hand. When it comes to decorating style, it’s all about the details, right? As I thought about how I pulled together my own kitchen, I realized I could narrow the process down to 5 kitchen decorating tips. 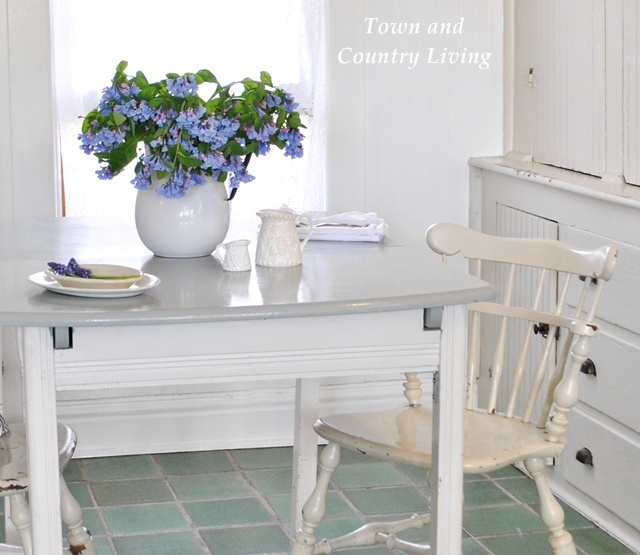 My style is a mix of farmhouse and cottage. I live simply so fussiness isn’t something you’ll find in my home. But to each her own and you need to find what works for you. Create a kitchen decor board on Pinterest, pinning photos of kitchens you like. Then look at those photos and identify the common theme that unites them. It could be the color palette, the style of cabinets, and so on. For me, this is the fun part! It can sometimes take me weeks or even months to choose a color palette for a room. I like to create a feeling or mood in a room and I try to let the room tell me what color it should be. My kitchen is on the north side of our house so I chose lighter colors for this space. I also had to consider the green of the Mexican tiles on the floor. I finally settled on a palette similar to a photo I saw in Country Living magazine. The walls are Vanilla Custard (by Behr at Home Depot) and the bead board is Ultra White (by Valspar at Lowes). 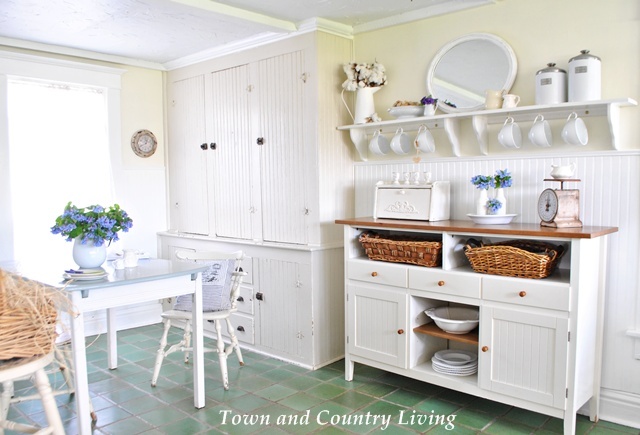 This built-in cabinet and the standard kitchen cabinets are painted Tortilla by Martha Stewart. An important side note – make sure your color palette is conducive to your decorating style. It’s extremely important to stay focused on your style when choosing kitchen decorating details, otherwise the room can start to look hodge podge. I’m sharing several photos to drive home this point. 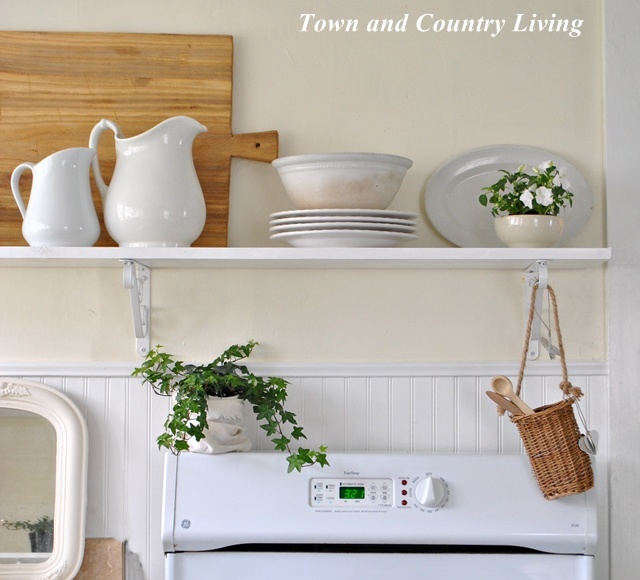 When I think of farmhouse and cottage kitchens, I think of open shelving. In the photo above I used 2 stock shelves from Michaels and paired them side by side. They’re painted the same Ultra White that’s on the bead board. The open shelf above the stove is made from a long plank of wood from Lowes, cut to fit the space. I found the curlicue brackets at Lowes, too. They add a touch of femininity to the space. 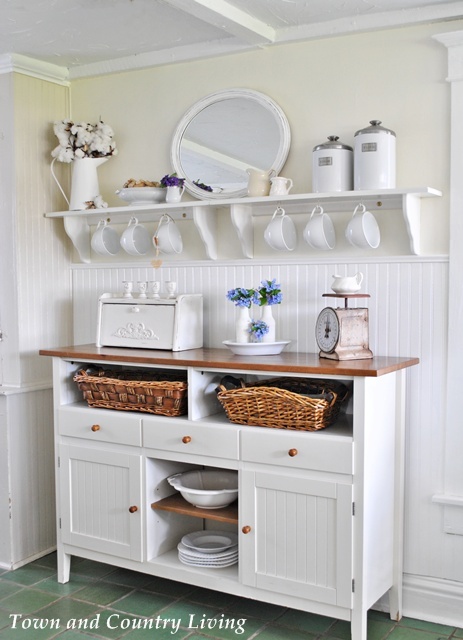 Freestanding pieces like this sideboard from IKEA reinforce a cottage farmhouse style. 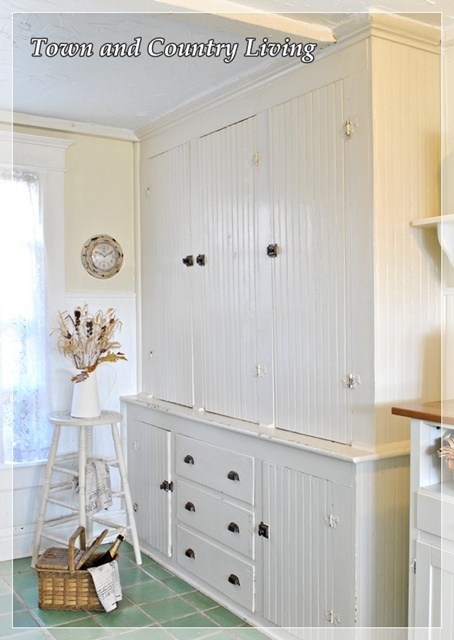 Note the details of the doors that match the bead board on the wall. It’s the little things like this that continue to tie a theme together. 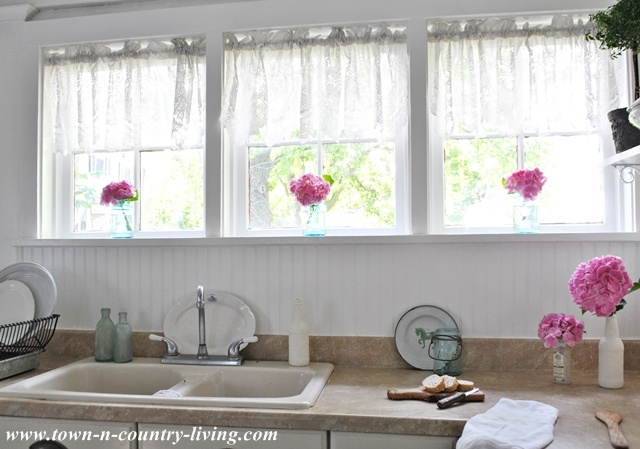 Simple lace valances in this trio of windows above the sink echo the cottage theme. This is where you can really start to have fun! You’ve already laid the groundwork by identifying your style, choosing a color scheme, and reinforcing your style with various elements. Now you get to accessorize with stuff you love! 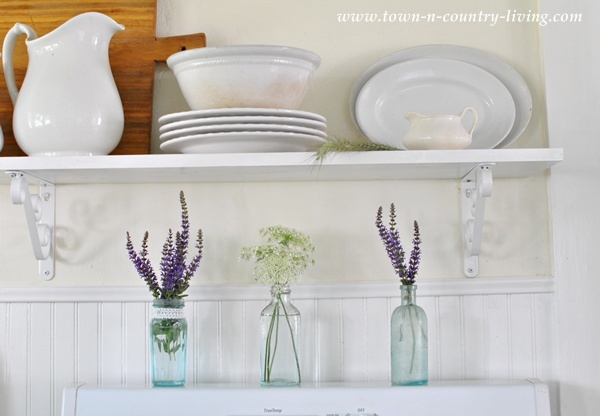 I love white ironstone and fresh flowers so you’ll find both throughout my kitchen. A trio of ironstone pitchers rest on a short shelf. While we’re looking at this photo that shows the bead board, let me offer up another kitchen decorating tip. People often ask how I keep my white kitchen clean … and it’s really quite easy. I used kitchen cabinet paint on the bead board. Dirt and grime wipe off surprisingly easy and the cabinet paint is resistant to stains. In addition to the ironstone, I love any white dishes. Since they’re the same color, you can mix and match them. 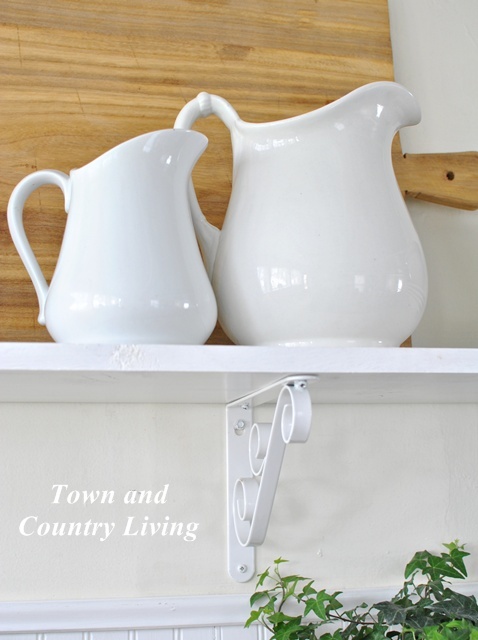 Oversized coffee mugs from my daughter hang from the open shelf above the kitchen sideboard. More fresh flowers! 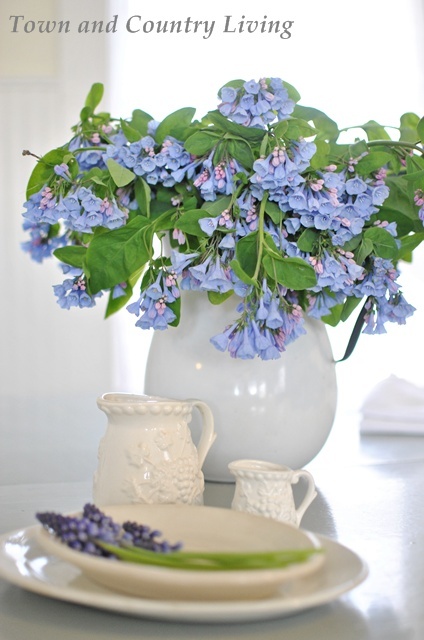 This big bunch of Virginia Bluebells came straight from my garden and provide a focal point on the breakfast table. 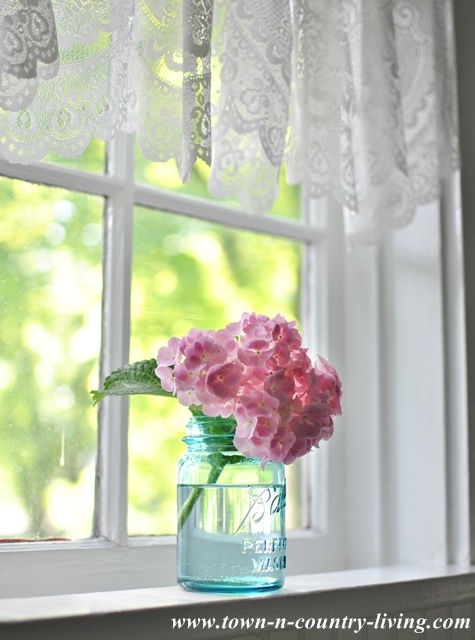 And on the other side of the room, a blue Ball mason jar holds a pink hydrangea bloom. Didn’t I tell you adding stuff you love would be fun? 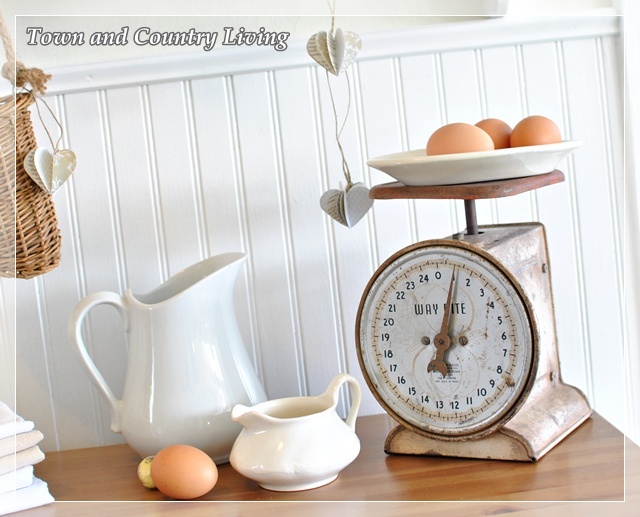 Finally, a rusty little kitchen scale is added with brown eggs sitting on a white ironstone plate. For fun, I added a bit more detail by hanging 3-D paper hearts. Now, onto the final of the 5 kitchen decorating tips. While you’re decorating your kitchen, keep in mind that above all else, it needs to be functional and comfortable to cook in. Hopefully your home’s designer carefully considered placement of the stove, sink, and refrigerator. Beyond that, add comfort in other ways. I love this little painted table I found at the flea market. It typically seats 4, but a leaf tucked inside the tabletop allows it to seat 6. 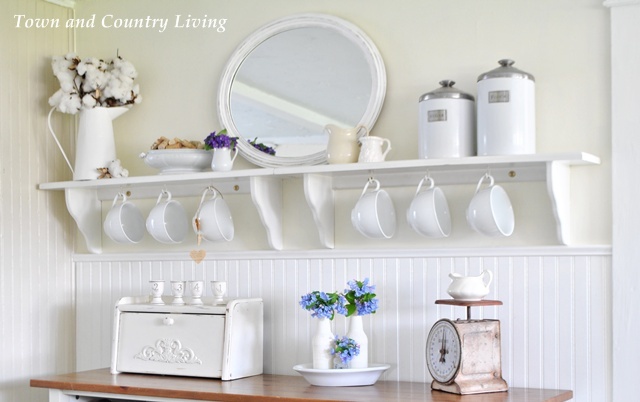 While the white ironstone might look pretty on display, I do use it! 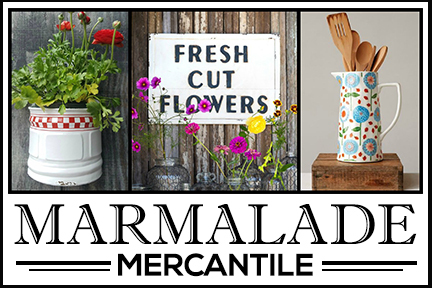 Since most of the pitchers, platters, and bowls are stored on open shelves, they’re just an easy reach away! The shelf above the stove is high enough so they don’t get any splatters from cooking. Although I do keep utensils in drawers, I also like to have them out in the open so I can grab them easily. This way, if I have something on my hands, the drawer pulls don’t get dirty. 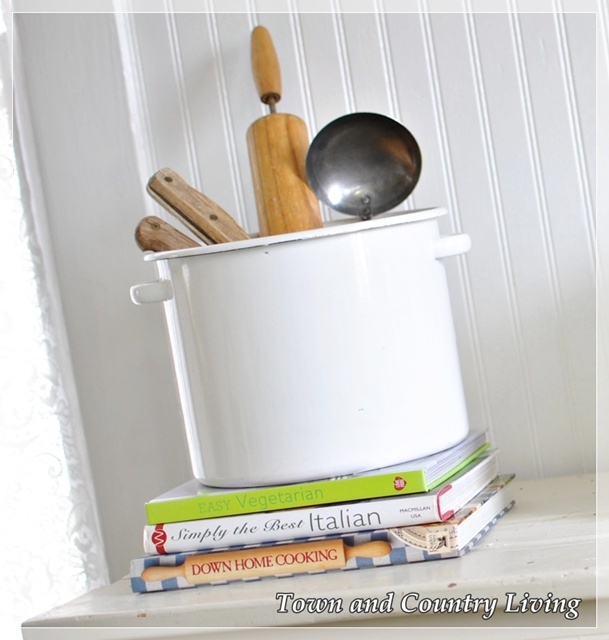 You’ll always find a few cookbooks out in my kitchen as well. 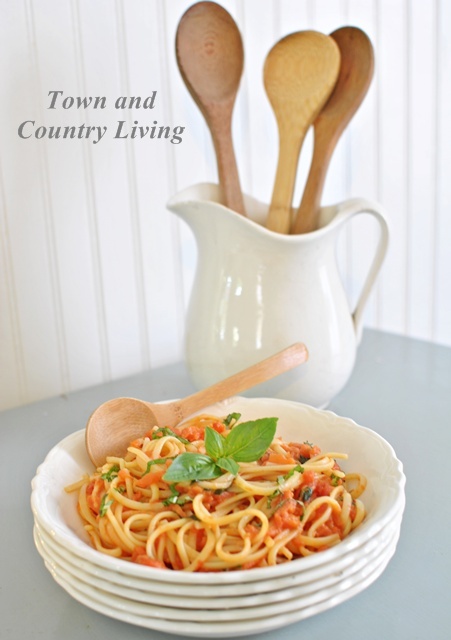 I love to cook meals like this Tomato and Basil Spaghetti dish, but if my kitchen wasn’t comfortable and functional, it wouldn’t be much fun. I hope you’ve been able to take away a few of the kitchen decorating tips that I applied in my own home. And I also hope you’ll visit the other bloggers’ kitchens to gain even more insight and inspiration! 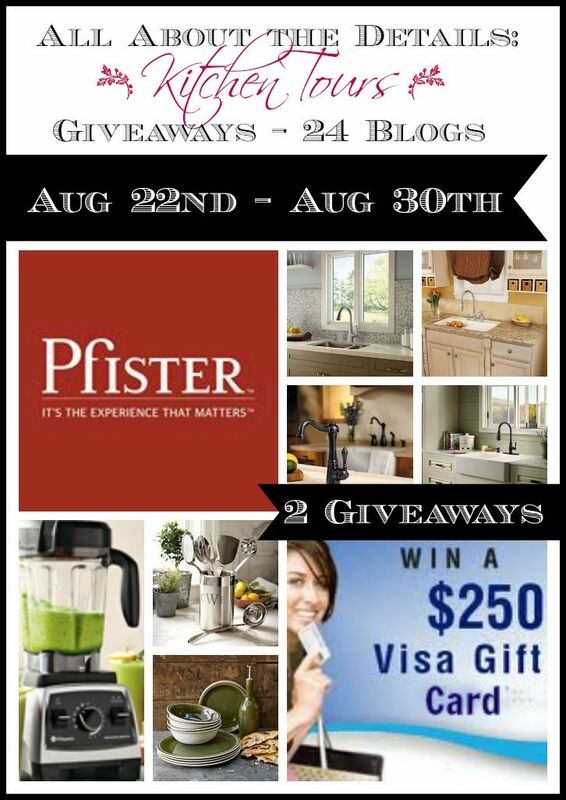 The schedule is below, along with the information on how to enter to win the Pfister faucet or the $250 Visa gift card. One winner gets the faucet, the other winner gets the gift card! Don’t miss the rest of the kitchen tours this week! Absolutely beautiful farmstyle kitchen!!! Enjoyed! Your tips certainly worked for you, Jennifer! You have a beautiful kitchen. I love how you’ve decorated it without having stuff in your way. I like to have pretty things on the counters, but there is just not that much room here so I have to make sure I keep it simple. Always love touring your beautiful farm house kitchen. 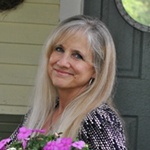 found you on the kitchen tour – I love your kitchen – I am a new bloglovin follower! Great tips and beautiful kitchen! 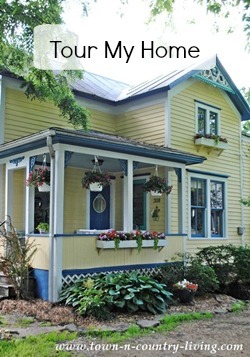 Jennifer great tips, I have been going on Houzz a lot lately and getting ideas for our new kitchen. I want our home to be very French Country. I love that style and I want to do my homework. I also bought some great books to help with the process. Pinterest has not been working for me for months now. I have been having a feud with them over this issue. I go on there all the time. 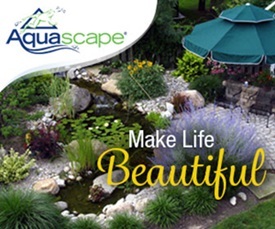 I always love and enjoy seeing your home! You sure have charming kitchen! Love the white, bright, light kitchen, dear one! I agree. . .its all in the details! 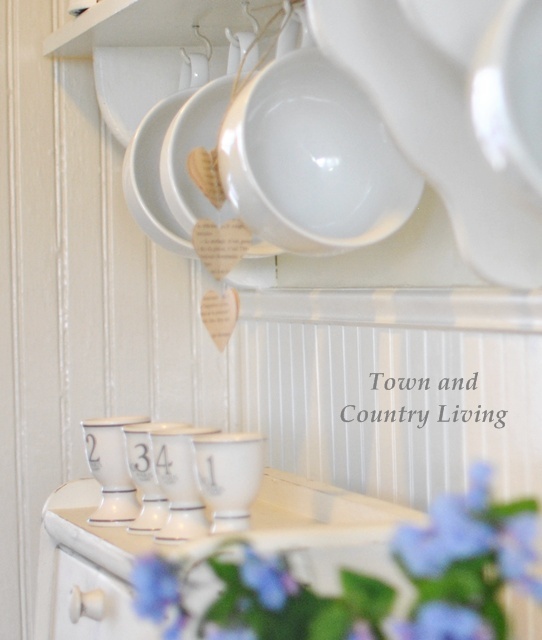 Love how you’ve added the personal touches of Cottage decor! Thank you for inviting us into your home!!! I love your kitchen Jennifer! It’s so fresh and bright and perfectly farmhouse. Great tips! Your kitchen makes my heart stop for a moment. It’s so airy and beautiful. It’s has a vintage feel, with such warmth. I adore every thoughtful detail. I loved your take on the tour and thought your advice was really point on. I am in love with your kitchen and your home. GREAT tips, and great reminders! Your kitchen is so clean and bright and cheerful and inviting! Your recipe looks soooooo delish. Your post was perfectly done and had such eye candy. Thank you! I posted my first kitchen post in celebration! 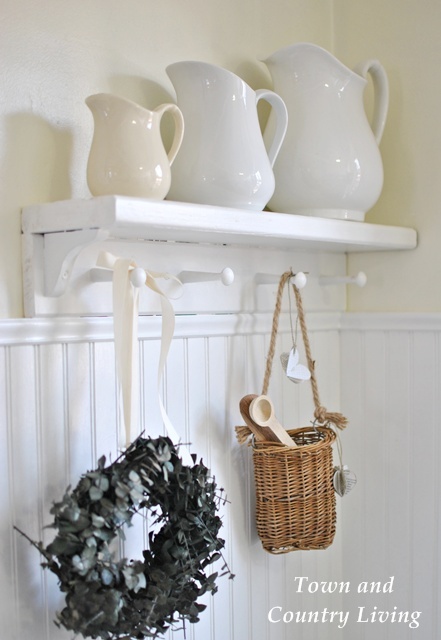 i just love your kitchen…it is as fresh as a pail of milk coming in from the barn 🙂 i am looking for lace valances for a kitchen i’m working on…do you know where yours were peurchased or did you make them? Beautiful!! I love all the white, it’s just gorgeous! Your kitchen is lovely, Jennifer. I love all the whites mixed with the wood tones. Thanks for sharing a details tour. Always enjoy touring your lovely kitchen Jennifer! Beautiful Kitchen!! I love the lace curtain so much and that scale uhh i want one of those, some day! Your kitchen feels so bright and welcoming, you did a wonderful job decorating this space! Hi Jennifer. I love your kitchen! I can easily imagine myself enjoying a relaxing cup of coffee or tea there. You’ve done a great job of combing the elements to create the farmhouse/cottage look. Your tips for advising others were spot on! Absolutely beautiful, Jennifer. Light and bright and filled with personality. You capture your style perfectly with your hints, too. Great post! What a beautiful kitchen – thanks for your handy tips! So bright and charming – love it! Your Pictures are absolutely stunning !! Bright and Fresh ! Wonderful tips….and so true. The way you broke it down made it simple and easy to follow. I love white kitchens and yours is no exception!